Something I love about our neighborhood of Minneapolis are the many creative people who share their art (and other forms of creativity) with others. We have a very unique May Day parade, an annual art fair in the park, the Empty Bowls fundraiser for hunger-related causes where all the soup is served in handmade pottery bowls, the Art Sled Rally, and more. In our six years living here, we’ve never before made it to the Art Sled Rally. It’s kind of understandable, really. I mean, who goes out to stand in the park in the middle of January in Minnesota to watch people on sleds? 😉 Well….lots of people apparently, including us this year just a bit over a week ago. From what I’ve heard, people come from all over the metro area, not just our neighborhood, to participate. Sleds and riders were adorned to look like anything from a loaf of bread to a dragon to a tea cup to a sick polar bear (yes, really!). 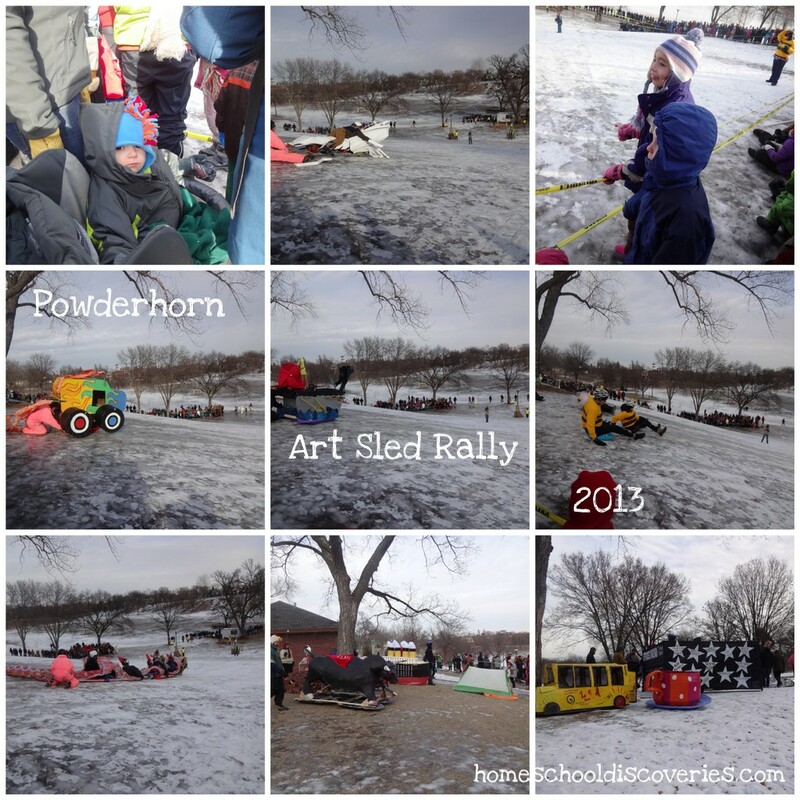 Conditions were very icy this year, so the sleds were “guided” down the top portion of the hill before being released to travel the rest of the way down the steep hill in Powderhorn Park. A little over a week ago, Miss M and Mr. E gave book reports at our co-op. One of the reasons I really like participating in a co-op is opportunities just like this. The kids get up in front of their class (a group of 8 or 10 students about the same age) and talk about a book they’ve read. While we can discuss books all we want at home (and we often do), it is a growing experience to organize your thoughts into a few sentences or paragraphs someone else will understand, and getting up in front of a group to share those thoughts. Miss M is really never nervous to speak in front of anybody, but writing out her book report has caused some stress in past years. She narrated to me and I wrote it down as a first grader (we were in a different co-op when she was a K’er), then last year as a 2nd grader I thought she should probably be able to write it down for herself — a process which caused a few more tears than I was expecting. Some of the tears were due to stress at not knowing how to spell what she wanted to say, and some of the stress was due to the difficulty she discovered in explaining the book she selected — she picked a mystery, which was hard to explain without giving away the whole ending! This year, Miss M made an easier book selection (one of the “Caroline” American Girl books), and has gained a lot more confidence in her spelling abilities. In the book report process she mostly needed a bit of help to organize her thoughts and decide which details were important to communicate in order for the plot to make sense. This was Mr. E’s first year to give a book report at co-op. He wanted to pick The Way of the Ninja, a favorite Lego Ninjago book I’ve read to him several times. He didn’t have too much trouble summarizing the plot, with me writing down what he wanted to say. Prior to book report day, Mr. E was pretty nervous about giving his report in front of his class of K through 2nd graders. I reminded him that I could listen in and prompt him if he got stuck on a word, and that his friends would enjoy listening to him give his report. In the end he did a great job, reading some complicated words that he wanted to use and only getting stuck once! We heard a lot about Ninjas over the last couple weeks with Mr. E thinking about and then practicing his book report. By book report day, Miss M was inspired to write a Ninja Christmas Carol. I guess she still has Christmas on the brain! The kids took this as close enough to “Yes” to start acting out their own creative charades ideas while I watched (with Tony joining us a bit later). It started out simply enough. Miss M was a “flower girl” and then acted out “grocery shopping.” Mr. E was driving a tank and shooting. Then Mr. K was driving a tank…and (as we later learned when our guess of “driving a tank” was wrong) and spinning around to kick holes in the tank with his feet. Next Mr. E was The Avengers (all of them, acted out in sequence). Miss M was a character from a book (and we had to guess which scene she was acting out to be “right”). Then Mr. K was “Lightning McQueen meets the Avengers”. And Mr. E was “building with legos…and cutting a hole in them”. And on, and on. Meanwhile Tony and I are laughing non-stop as the kids wildly re-enact something that only made sense to the kid doing the acting. We played our part by giving ridiculous guesses…and trying to explain that usually if you want to “win” charades, you act something out in a way that the person guessing finds easy to understand. I think they thought they were going to win by having us guess as few of their actions as possible! Ah, gotta love creative kids! Two weeks ago, when we were working on Logic of English Essentials List #16, Miss M started writing a story to practice her spelling words. She didn’t finish the story before the end of that week. But then when I asked her to write sentences including the “wor” phonogram words she learned for lesson #18, she decided to finish out her story with those words. She wrote it out in pencil, then I helped her with a bit of editing. I was so proud of how she spelled very few words incorrectly, and usually picked fairly logical phonograms to spell the words when they were spelled wrong. Even the grammar and sentence structure was pretty good — especially considering we’ve done very little formal writing instruction (I figure there’s time for that later when we’ve finished our year of intensive spelling instruction!). One day I had some dollars and cents. I spent it so that I could attend a school where I could take lessons on how to grow silly plants. I get to pour water on my plant. I do not yet know what kind of plant mine is. But the next day I find out that my plant is a new kind of plant that eats germs. Today is the last day, and I get to take my plant home. Now I own the plant. I have a wonderful idea! It would make an excellent gift for Lilly. So I put the plant in a shoe box and started walking over to her house. But then all of a sudden, the plan started to grow and grow and grow! What am I going to do? This is the worst time for it. “Ok. You know I have a bunch of worms in my back yard,” Lilly said. There’s no doubt that each kid is a unique individual. I’m sure that this will be true even among my three boys, but I see this difference so strikingly between my daughter (Miss M — she will be eight in May) and my oldest son (Mr E, turning five later this month). Miss M had a “brainstorming” sort of assignment in her Spectrum Writing workbook last week. First she needed to make a list of topics she is interested in and knows something about. Then she picked one of those topics and listed everything she knows about that topic, as well as a list of questions she would like to know the the answers to related to that topic (yes, that’s a grammatically awkward sentence, I know). Mr. E heard Miss M and I working on this (Miss M talked me into being her scribe so we could get her ideas on paper more quickly). He wanted to do the same thing. These lists could hardly be more different, huh? I think I got even more insight into my two oldest kids in the next step of the process. Miss M picked “bunnies” for her next step and we wrote out a nice list of facts she knows about bunnies, as well as some good questions. Mr E. didn’t actually want to do exactly what Miss M was doing for his assignment. He wanted to give me a list of questions and topics — things he is wondering about or wants to know about. It’s a great list! What were the weapons of people that knights fought? How are crowns with jewels made? Why do we have bones in our bodies? He also told me he wants to build a robot, made a real model airplane (not one made out of paper), a model airplane “launcher”, and his own Star Wars movie. Fun stuff, and fun questions! So, I thought I would ask Miss M a question that might lead her to make a list like Mr. E gave me. Her response was that she wanted to learn more about horses (that’s her “expert day” topic for our co-op this year), and that she just wanted to read lots of books. I pressed her a little bit, and she said yes, she did want to do more art projects, and learn history as we read through our history curriculum and learn how to play tennis through the park tennis program again this summer…but what she really wants to do with “extra” time is immerse herself in all kinds of stories. She wants to read stories, write stories and “play” the stories. I was the exact same way at her age! I had insatiable curiosity about things like science and computers as I got older, but when I was a second grader…I was cleaning the library out of stories from my favorite authors and series too. 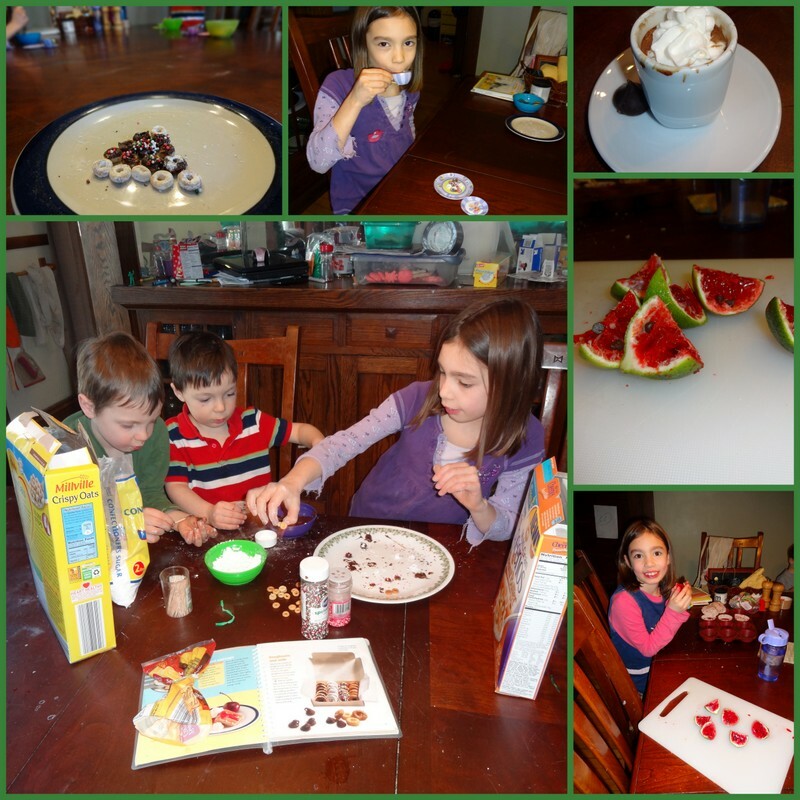 I just love the different ways that God has created my kids and the differences in their interests…it makes our home an even more lively and exciting place!